Blanca has everything she ever wanted, a hot boyfriend and the loving support of her foster father. She’s finally escaped the abusive control of her birth father and her tortured childhood at Tabula Rasa School. But the scars of Blanca’s Vestal upbringing run deep, especially when the FBI start asking questions. Blanca feels abandoned by her boyfriend, who is hunting for Lil Blanca has everything she ever wanted, a hot boyfriend and the loving support of her foster father. She’s finally escaped the abusive control of her birth father and her tortured childhood at Tabula Rasa School. Blanca feels abandoned by her boyfriend, who is hunting for Lilith, Blanca’s only blood relative. The Defectos, a support group of Vestal-Rejects, offer Blanca comfort which she readily accepts. To ask other readers questions about Damaged Goods, please sign up. Damaged Goods started out pretty slow for me. The first book started out pretty fast paced but this sequel felt very much like a sequel. I did really like how this book explored more of the world created in Genesis Girl and I thought the character development was really good. I still wasn't connected with Blanca though. She still felt... off. I can't put on my finger on it but there's just something about her that I don't like. I did like how her abusive upbringing was acknowledged a little bit Damaged Goods started out pretty slow for me. The first book started out pretty fast paced but this sequel felt very much like a sequel. I did really like how this book explored more of the world created in Genesis Girl and I thought the character development was really good. I did like how her abusive upbringing was acknowledged a little bit more and Blanca was actively learning to move forward with her life. This continues the story of Blanca. A Vestal. An internet virgin who got bought by a very wealthy individual who owned a solar panel company. In this book, Blanca ceased to be an internet virgin. Instead, she used the internet to expose the Vestals. As chaos erupts in the midst of the Vestals, a rival organization threatens to add more to the chaos. This has been a heart-pounding adventure. Just when Blanca thought that everything is alright with her world, then another explosion threatens the s This continues the story of Blanca. A Vestal. An internet virgin who got bought by a very wealthy individual who owned a solar panel company. In this book, Blanca ceased to be an internet virgin. Instead, she used the internet to expose the Vestals. As chaos erupts in the midst of the Vestals, a rival organization threatens to add more to the chaos. This has been a heart-pounding adventure. Just when Blanca thought that everything is alright with her world, then another explosion threatens the security and safety of her new foster family and the lives of people she grew up with. More secrets are revealed about her birth and her birth parents. Just when you think this story has done enough surprises and blasting events, you are wrong. Just when your racing heart has found its normal rhythm it will jump right out of your chest for a shock that will come out of nowhere. This book has more surprises in store than a girl coming out on her debut. You will never be prepared enough for all the scenes that will kick you out of your seat. This is a not-to-be-missed book in a series. Revelation after revelation will astound you. If you have a heart problem, make sure to have your doctor on-call as you will never know how your heart will take the rest of this story. Better be prepared for the eventualities because you can never prepare for the jolt and shock waves the story will cause. This book will never give your heart a rest. I had been rendered speechless and immobile. I would have fallen off my seat if I were not lying down. I give the book five/five white motorcycle helmets and more. This is one of the best stories I have read so far this year. I can't wait for the next book. I wonder if it could sustain the chaos, excitement, and havoc this book has created. Congratulations Jennifer Bardsley for the havoc you have caused. I am all for it. So when you find love, when it comes to you with the full force of glory, you need to embrace love and hold onto it with all your might. This is such a great read! Longer review to come when I get home (read it on a road trip, lol). But if you read Genesis Girl then you won't want to miss out on Damaged Goods. This review was originally published on Spinatale Reviews. Damaged Goods picks up a short while after the ending of Genesis Girl. Blanca and the other Vestals are adjusting to life after the events of the first book. Jennifer did something amazing with Damaged Goods – She managed to write a sequel that I enjoyed even more than the first. Blanca grows so much in the course of this novel. She was still somewhat aloof and difficult to relate to at first. As the story progresses, the layers are slowl This review was originally published on Spinatale Reviews. Blanca grows so much in the course of this novel. She was still somewhat aloof and difficult to relate to at first. As the story progresses, the layers are slowly peeled back to show us who Blanca truly is as a person. I particularly liked how the trauma Blanca went though both in her earlier training (we get flashbacks into her history in this book!) and the last book is dealt with. As for the secondary characters, they were overall good. However, I was left wanting more depth to them, particularly Seth. There was an important issue that arose in his relationship with Blanca and it was never discussed or truly dealt with (maybe it will be in book 3?). I honestly wasn’t a huge of him in this novel though. I thought that many of his actions weren’t what you would expect from the sweet, caring guy he was in the first book. The plot moved along faster than it did in Genesis Girl. The inclusion of the FBI, the Guardians, and the Rejects really helped develop the world. Additionally, I loved how there were so many different views about Vestals in this book, the issue of technology addiction was well developed and discussed. I don’t want to spoil anything so all I’ll say is that I definitely did not see the ending coming (but I loved it!). I can’t wait to see what happens in the next book. Unfortunately, Damaged Goods fell a little short to me. I personally feel the first novel had a really solid conclusion, and a few of the conflicts in this sequel didn't fully make sense to me. Something I did enjoy though, was the involvement of political ideas and the controversy of having a school such as Tabula Rasa. Damaged Goods also didn't hold my attention as much as Genesis Girl did, and I think it was because my mind for some reason didn't want to accept these new conflicts. I did find Blanca's struggle with basically realizing she grew up in a cult was very intense and raw, and it added depth to the story. With all of that being said, I still think that Genesis Girl is very interesting and definitely worth the read if the premise interests you! I want to thank Month9books Publicity for sending me this ARC in exchange for an honest review! Once again, I finished a Jennifer Bardsley book the day it arrived! Damaged Goods was such a roller coaster ride of excitement, emotion, and suspense! If you haven't read the first book, Genesis Girl, go read it right now! And then read Damaged Goods so we can talk about it! This review doesn't have spoilers if you've read book one...but if you're new to this series I suggest you read Genesis Girl (and I want to thank Month9books Publicity for sending me this ARC in exchange for an honest review! If you haven't read the first book, Genesis Girl, go read it right now! And then read Damaged Goods so we can talk about it! This review doesn't have spoilers if you've read book one...but if you're new to this series I suggest you read Genesis Girl (and my Genesis Girl review) before continuing this one! We really see a lot of inner struggle and character growth with Blanca in this second book. Abandoning her vestal life at the end of Genesis Girl, I was curious to see how she would deal with being in the public life. 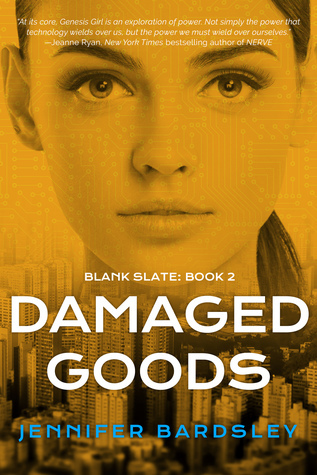 In Damaged Goods, she really has to find out what kind of person she wants to be, and whether or not her morals and traditions are meant for this new life. The McNeal family continues to be my favorite part of this series. Cal McNeal is an angel, and a wonderful father figure, both in Genesis Girl, and continuing into Damaged Goods. If only everyone could have a parent as loving as Cal! And of course, our ruggedly handsome Virus, Seth aka Veritas Rex, plays a big role in Blanca's life. But so do some other characters, some we know, some we don't know so well! But we get to know them, that's for sure. This book just throws you right back into this world, and you hold on for dear life while it whirls you around and around, in the best way! It brings up questions of loyalty, family, relationships, and trust! It sparks many conversations about how much technology may be too much, or if there is such a thing as too much! It's very interesting for people in my age group. Many of us didn't have cell phones and home computers until we were out of high school, so we've seen both sides of the spectrum. 4.5 stars. This was a great follow up to the first novel! The political implications that come up in this second book were fantastic. This book kept my attention from start to finish. Sadly, I DNFed this book at a little over 13%. Jennifer Bardsley is a great author and her writing is why I started reading this books but I was no longer interested in the characters. The first novel was fantastic and I deeply enjoyed it but I just couldn't commit to this one at this time. I will be trying to read this again but I can't right now. *Month Nine Books sent me an ARC of Damaged Goods in exchange for an honest review. I'm going to try very hard not to spoil anything! So read at your own risk. Well here we are again, dipping into the scary-dystopian Blank Slate world! I am not usually a fan of dystopian novels but I have been 100% on board with this series. Probably because I can see this type of thing happening IRL, and also because we're all at least a little addicted to technology, so it's fascinating to think what life would be like if we either had no tech (like the Vestals) or all the tech, all the time (like the Viruses). In Damaged Goods, Blanca is trying to figure out what she's actually going to do with her life now that it's hers to do with as she pleases. Remember Julia Roberts in The Runaway Bride where she couldn't tell you how she liked her eggs because she never had any opinions of her own? That's how I think about Blanca. She's always been told how to behave and that she can't have any thoughts, feelings, or opinions of her own. Now that she's free and in the loving and supportive arms of her new family she has to figure it all out. And that's not so easy to do. Once Blanca determines she wants to go to college, she has an immediate hurdle: while Tabula Rasa provided an excellent education when it came to the arts and languages, she's sadly lacking in any good math or science skills. Her STEM-deficiencies are meant to be overcome with the help of a private tutor to work with her in these areas until her college interview. Her boyfriend Seth is kind of all over the place. He obviously loves Blanca but also has his own responsibilities with his viral blog, Veritas Rex. His own addiction to tech and Blanca's refusal to start wearing color (which might sound silly if you haven't read this series but I figure Seth equates wearing color with finally breaking the mental hold her Vestal/Tabula Rasa upbringing still has on her) is a constant cause of conflict in their relationship. Old flames from both their pasts show up in this book, making me squirm and yell, "Drama Llama!" every other chapter. At one point I was just hit over the head with how immature Blanca was acting, but then I remembered: duh. She's only been really living IRL for a few months and has had a complete traumatic upbringing, with no experience with any fulfilling relationships, so she's still figuring it all out. And she's a teen, and teens do drama like TNT does drama. Anyway! There's another rival organization introduced, The Guardians, aka the Chinese version of the Vestals. Trouble is a brewing, and you know our girl is going to get mixed up in it and have to figure out what to do. I'm leaving out the details of the action because I am horrible at not being spoilery when I talk about those things. Just rest assured this book is more than teen angsty drama and is definitely as fast-paced as Genesis Girl, with similar levels of suspense and plot twists I didn't see coming. I have to say more about our heroine. Not only is Blanca brave, but she's also completely fragile. She's got so much living to do to catch up to her contemporaries, and not just in her STEM education. That's why I really, really love reading Blanca's stories. Her whole family history is all messed up (not mentioned here, because spoilers for the first book, Genesis Girl, and I'm not a spoilerer so you should go read that 100% before reading Damaged Goods!). Which is a constant force in her mind and her heart. How should she feel about her history? What should she do differently? How does this all impact her current life & relationships she's trying so hard to make work? I will try to keep this spoiler free! Damaged Goods takes place 3 months after Genesis Girl. Blanca is still recovering from being held captive by her father and witnessing her mother die, she is also confused on how to feel about Lydia being her mother. She suffers from her own unique version of PTSD, which is thrown together with her Vestal conditioning. I related/agreed with Seth and Cal's point of view concerning Blanca. I wanted her to see how difficult she was being, but at the same time, I had to remind myself that this girl had been through a lot and she was basically raised in a cult like setting. Over the course of the book she does get better and better, and her character growth is great and steady. I really appreciate the way Jennifer Bardsley wrote these characters especially Blanca. She didn't get some magical fix or a complete overnight personality change. She had to learn through trial and error. Another things I loved about the book was the Philosophy and Psychological aspects. Tabula Rasa reminded me of an assignment I had in a psychology class, where I had to design my own school. Instead of a school without technology, my school gave the students only technology. It was funny to me because I guess the blank slate world would be the effect or the outcome of my school. I really liked Damaged Goods the second book to Genesis Girl. The story continues with Blanca, the former Vestal whom lived her entire life secluded in Tabula Rasa. For she never had her picture taken, she was virtually untraceable, a pure person so to say. In the last book she was auctioned off to Cal McNeal and was also abducted by her birth mother Ms.Lydia and her birth father the renowed leader and founder Barbelo Nemo. Both her parents were killed Ms.Lydia right shot in front of her and Barbelo by her friend Beau another Vestal whom was also being held captive. Now Blanca is a former Vestal and de-cuffed, expelled from her brotheren. Blanca is also the most famous Vestal in history, besides her biological father Berbelo. She is also known for riding her all white motorcycle through town and definitely gets noticed. When the FBI starts questioning her about a former "friend" named Keung who is a Guardian. She says nothing, because her training and her experience says to trust no one. Cal and her boyfriend Seth (who is Cal's son) say she needs to get out and talk and meet people but Blanca still doesn't trust it and prefers to stay home. But Cal made her an appointment with a therapist anyways. All the while Blanca still doesn't trust people and starts getting notes of Vestal quotes. After a photo shoot she reconnects with Keung and he states that her boyfriend Seth should get his fingerchips removed. But Blanca still is the type to not trust people and does say something to Seth, but he pretty much puts it off as it as her being a Vestal and it leads to them breaking up. After an impromptu vacation to an island that Blanca just found out that she owned, she was able to see her best friend Fatima get married. And was really able to think about things, she even wore a purple bikini that was her mothers. On this trip Blanca wore a purple bikini and really thought about things. On the trip back home Seth went to use his fingerchips and screamed out in pain. It sent fire all the way up his arms and was burning him, so they had to cut them out and the plane crashed. Blanca heard a foreign language playing and decided they had to go to the FBI. Blanca really can do anything because she is a survivor and she had good judgement..at times. But the rest of the story is up to you to read, because it really is a doozy! And I really don't want to ruin it for you! I was given a free copy of this book by Month9 in exchange for my review! HOLY. LORD. Literally was not expecting any of that. When I first read Genesis Girl, I knew I was in for it. A world where technology has literally overtaken everything and is more important to people than their relationships. I bought it completely. I was a fan of Blanca and the way she evolved as a character, from a Vestal into who she was at the end of the book, thinking for herself. I was not expecting the twists and tur I was given a free copy of this book by Month9 in exchange for my review! I was not expecting the twists and turns this book took. Blanca is still figuring out how to be a person and not someone who follows everything someone else tells her to do. We're following her in the aftermath of sorting out what happened to her in Nevada, and figuring out the ups and downs of a relationship with Seth. My rating is really more like 3.5 stars because I did really like it but not as much as I enjoyed the first one. While it was good and kept my interest it didn't grab me like Genesis Girl did. It was nice to dig deeper into some of the characters that carried over but I felt that the new ones weren't explored as well. I didn’t hate it but it was very slow. I feel like it was detailed in part that didn’t need that much details. An immensely enjoyable story! Even better than the first, this is dystopian action-packed romance at its best! I received an ARC in exchanged for my honest review. I enjoyed Genesis Girl but didn't love the development of Blanca's character. This book completely changed my views. Blanca comes into her own in this book. It's action packed, full of mystery and kept my attention for the entirety of the book. If you liked Genesis Girl, you must read this. It's even better. Of course, the cliffhanger ending leaves me wanting more of the story. How will Blanca's life turn out? Will she become everything she wa I received an ARC in exchanged for my honest review. I enjoyed Genesis Girl but didn't love the development of Blanca's character. This book completely changed my views. Blanca comes into her own in this book. this review is also posted at the Blacksheep Reader. good follow-up for Genesis Girl. I read Genesis Girl because of its premise -- a world where gadgets have caused cancer, that gadgets are evil and breaks relationships, and some children are sent to Tabula Rasa, a school where they are raised without connecting to any form of gadget. You like that? Of course you do! Admittedly, it wasn't a very exciting read for me but I still enjoyed it. Which is why I read this sequel! Damaged Goods started r this review is also posted at the Blacksheep Reader. Damaged Goods started rough for me. I think that mainly this is because Genesis Girl ended well and while the problem was not completely resolved, the ending felt good for me. It was satisfying. The sequel had to break that ending and open up a new problem -- thus the Guardians were introduced. It doesn't take a genius that they will play an important role later on in the story. Aside from the Guardians, the Defectos were somehow given enough time to be introduced. Blanca thought of this group as the people who can truly understand her thoughts - Cal and Seth were definitely a no-go for that because they do not exactly know how vestals think despite their knowledge and all. I honestly like that Blanca is still not fully 'normal' in a sense that she's still completely paranoid and still doesn't fully trust people. There's always that lingering thought in her that what-if this person is actually this or that. People don't change overnight, we know that. And that's what's shown here. Seth and Cal did a lot of things for Blanca but of course, it will take a LONG time to change the things Blanca was taught for more than ten years of her life. Changing her in just a couple of months is too far-fetched. One things for sure though, Blanca is braver than before. Of course, she should be because book one developed her to be one -- to be someone brave and able to make sound decisions. Blanca is a heroine to root for. She still has her faults, her lack of trust, her paranoia, and the secrets she keep to her self because of the first two things. The romance, however, took a sad turn for me. I mean as much as I'd like to love the conflicts that were introduced, I'm not really a big fan of love triangles. Both sides, Seth and Blanca, were given past relationships, Tiffany for Seth and Keung for Blanca. There really wasn't much development on their relationship, just more trust. The ending was satisfying although it did leave a room for a sequel which I am honestly looking forward to. However, like many second books, this basically just prepared the world for the next (or maybe final) book and maybe you can classify this as one of those books going through second-book-syndrome. It has its faults but it was still a pretty good read a whole. Real Rating - 3.5 stars, bumped up to 4 for being one continuous story, when the previous book felt more like two thin stories smooshed into one book. Disclaimer - I was giving a copy of this book by Ms. Bardsley, who I met at a writing workshop, in exchange for a review. Continuing the story of Blanca, the former Vestal, we delve deeper into the mystery of her past, including her relationship to the newly introduced Guardians (a Vestal-like organization from China that churns out spies). This se Real Rating - 3.5 stars, bumped up to 4 for being one continuous story, when the previous book felt more like two thin stories smooshed into one book. Disclaimer - I was giving a copy of this book by Ms. Bardsley, who I met at a writing workshop, in exchange for a review. Continuing the story of Blanca, the former Vestal, we delve deeper into the mystery of her past, including her relationship to the newly introduced Guardians (a Vestal-like organization from China that churns out spies). This second installment has more depth, is faster paced, and overall I found the storyline more compelling because the world was already built and Blanca was less naïve robot and significantly more her own person. There was still some annoying teen angst, but I find that to be true of most YA books, so I don't hold that against what is otherwise a unique look on how tech obsessed society is, and how we put celebrities (Vestals) on pedestals they don't really deserve to be on. This sequel to GENESIS GIRL sucked me in, fast. Thanks to having a sick day, I read the majority of this book in one setting, and I'm so glad I got to do just that. I loved the questions that were answered in this book, the ones we were left with after reading GENESIS GIRL. The idea of children being raised in a classical education, technology free, is the reason I was drawn to this series in the first place. To have DAMAGED GOODS end with this being so very important, was done with such a fanta This sequel to GENESIS GIRL sucked me in, fast. Thanks to having a sick day, I read the majority of this book in one setting, and I'm so glad I got to do just that. I loved the questions that were answered in this book, the ones we were left with after reading GENESIS GIRL. The idea of children being raised in a classical education, technology free, is the reason I was drawn to this series in the first place. To have DAMAGED GOODS end with this being so very important, was done with such a fantastic twist it was hard to not gasp out loud (which I might have done). It seems like poor Blanca can't get a break, but despite continued issues, she stays strong and true to who she believes herself to be. While book two in this series didn't pack quite the punch that book one did, I still really enjoyed the story. The book was well written, and there was never a dull moment. I'm already curious to see where this will go next. Please note that I received a free copy of this book in exchange for my honest review. I take back what I said in my review about Jennifer Bardsley’s Blank Slate book #1 Genesis Girl. The way I read the ending of the book was not quite as extreme as I’d first judged. How do I know this? Because I’ve just finished reading book #2, Damaged Goods, as part of the Month9Books blog hop. The main character, Blanca, has by no means done a 180-degree switch in her deep-set values (to quote my former self) Please note that I received a free copy of this book in exchange for my honest review. I take back what I said in my review about Jennifer Bardsley’s Blank Slate book #1 Genesis Girl. The way I read the ending of the book was not quite as extreme as I’d first judged. How do I know this? Because I’ve just finished reading book #2, Damaged Goods, as part of the Month9Books blog hop. The main character, Blanca, has by no means done a 180-degree switch in her deep-set values (to quote my former self). Rather, she is in a state of unrest, picking and choosing between her learnt Vestal values and the persuasion of the tech-addicted world around her, trying to find a balance of her own. A balance that she can accept as being true to herself and not for either extreme. (view spoiler)[I actually loved the struggle that Blanca faced in coming to terms with the truth about her parentage and facing the fact that she grew up in a cult that has essentially lied to her her whole life. It reminded me of the final book of the Hunger Games and dealing with PTSD – a topic that most stories tend to glaze over. (hide spoiler)] And being a first-person book, I got to hear it all from her perspective: her every fear, doubt, and the inner battle in trying to figure out who she can trust. I don’t think this series would be nearly as good if it were in third-person, so thanks Jennifer Bardsley! This book was a page-turner and a quick read, so I found it easy to forgive the spelling and grammatical errors. And it was also, again, a mostly clean book, well suited to a young teen audience. I received an e-ARC of this book (and Genesis Girl) in exchange for my honest review. After reading Genesis Girl, I knew this was going to be a story that I couldn't put down once I started it. Some word choices the author makes still bug me, but I'm choosing to interpret it as a style choice - as if Blanca (who I keep calling Bianca in my head) is still trying to interpret the world after she gets out of her school. For someone who's never grown up using the internet (or technology), the first I received an e-ARC of this book (and Genesis Girl) in exchange for my honest review. Some word choices the author makes still bug me, but I'm choosing to interpret it as a style choice - as if Blanca (who I keep calling Bianca in my head) is still trying to interpret the world after she gets out of her school. For someone who's never grown up using the internet (or technology), the first introduction to that would be quite jarring and so is some of the word choices. This story plops you right in and is a seamless continuation from the end of Genesis Girl. Seth and Blanca are on their way to meet Cal at the restaurant and Blanca's still the celebrity in the eyes of the paparazzi, but now she has to meet a new hurdle (namely the FBI). I liked that there was more action in this one, as befitted the story. Blanca has to deal with all the things she's done and decided in the first book, but then people from her past come back, and she needs to deal with some new threats, all while learning how to think on her own and make decisions for herself. Isn't growing up fun? I liked that all her friends were back from the first book, including Fatima, who has a big part in this book. And Seth <3 I'd love to learn more about his tattoos (since he has so many) and what they all mean to him. I received this book from Month9Books in the change for my review. A sequel that does not disappoint. When I read Genesis Girl, I was happy to find something that was different from other books. Finally something that painted a picture of the future without the word dystopian. The author paints an amazing picture of Blanca's life in the future. Normally I struggle with sequels because they are never as good as the first book. This does not meet that stereotype. You get to continue learning about Bla I received this book from Month9Books in the change for my review. You get to continue learning about Blanca, understand more about how her personality that makes her who she is. It also have just the right amount of action to make you read the book in one night. Blanca lives in a time after cellphones created an outbreak of cancer. She and many other children were raised completely without technology to keep them pure, while in the world outside of her school, technology was in everyone's fingertips. Literally. Now she is out of her school and out of the grasp of their punishments. However, there are a lot of people who want to use her for their own good. I love watching her learn and grow as a person, trying to create relationships and I life of her own, all while fighting for the truth. I thought Damaged Goods was a great follow up to Genesis Girl. Blanca’s story continues in Damaged Goods with her learning how to move on and live life as a non-Vestal. Blanca is struggling to find a balance between the core values and beliefs she grew up with and where that fits into her new reality. In this book we learn about the Guardian organization, a foreign based offshoot of Barbelo Nemo’s vision who are less picky with who they graduate, and the Defecto group (former rejects from the Ta I thought Damaged Goods was a great follow up to Genesis Girl. Blanca’s story continues in Damaged Goods with her learning how to move on and live life as a non-Vestal. Blanca is struggling to find a balance between the core values and beliefs she grew up with and where that fits into her new reality. In this book we learn about the Guardian organization, a foreign based offshoot of Barbelo Nemo’s vision who are less picky with who they graduate, and the Defecto group (former rejects from the Tabula Rasa). We’re also introduced to both Blanca’s and Seth’s first partners. The introduction of these characters (Jessica and Keung) cause tension between Blanca and Seth and reinforces the trust issues theme that has Cal and Seth urging Blanca to see a therapist about. The best part of the book for me was towards the end when Blanca finally breaks down and doesn’t stop spilling her guts to the FBI agent. That interaction between those two characters came across very sweet, even when Plunkett was telling her that she had her therapist checked out. Jennifer Bardsley writes the parenting column “I Brake for Moms” for The Everett Daily Herald. You can find Jennifer on her website: http://JenniferBardsley.net or on her Facebook page: The YA Gal. An alumna of Stanford University, Jennifer lives in Edmonds, WA with her husband and two children.